(*): voltage divided! The divider consists of two 1 kOhm resistors, which divide the PC voltage of 12V to pocket friendly 6V! When you have a laptop you can add a switch which disconnects the second resistor from ground. Now you can use CLOAD (M) and CSAVE (M) to transfer data! 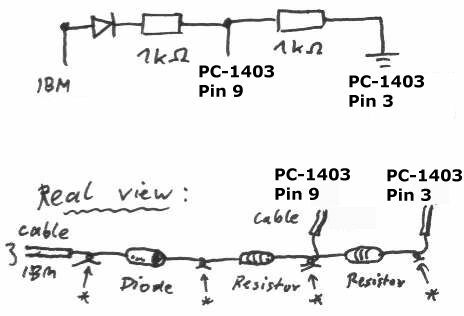 This describes how to build a serial cable for the PC-1403(H). You need the serial driver in the next chapter. My very simple version for my laptop without the second resistor and the switch. You need the special serial cable from the last chapter for this driver.